Once Donald Trump is sworn into office Jan. 20, his lease of the old Federal Post Office, now home to his D.C. Trump International Hotel, will become illegal, according to a law professor who studied the agreement. Steven Schooner, a law professor and government procurement expert at George Washington University School of Law, studied Trump’s contract, and he says there is a clause that requires elected officials have no role in the lease. 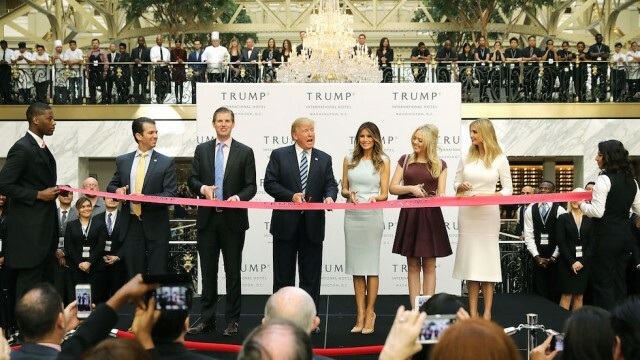 The luxury hotel, opened in October after $200 million in renovations, is not actually owned by Trump, who signed a 60-year lease for the building from the federal government. The historic building was originally the headquarters of the U.S. Post Office. But Schooner told NPR Tuesday one part of the contract will make Trump’s lease illegal once he assumes the presidency. “The contract between GSA and the Trump Organization specifically says that no elected official of the United States government shall be party to, share in, or benefit from the contract,” he says, citing a clause in the document. Schooner says the GSA should terminate the lease before Trump becomes president and cited numerous conflicts of interest. One such conflict is that Trump would effectively be both the landlord and the tenant of his hotel. Another is that diplomats or officials could book rooms at the hotel in an effort to get on Trump’s good side. “So the Trump transition team would be naming the person responsible for the agency that’s managing Trump’s lease. Obviously that’s a problem,” Schooner told NPR. The law professor’s statement comes after many Democrats have expressed concern and requested an investigation be launched into the president-elect’s potential conflicts of interest as president.